For older additions please see the articles page. 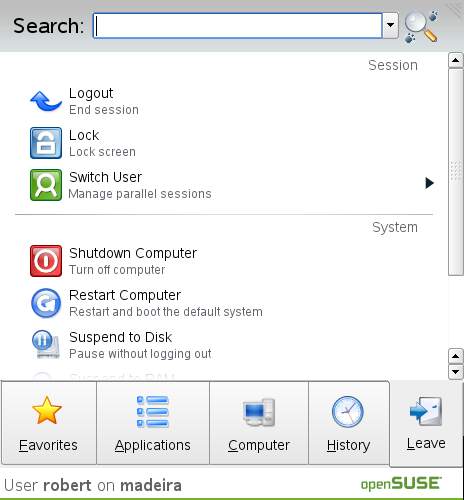 openSUSE 10.3 is a great Linux system, unless you run into problems. With perseverence and some time investment it is possible to fix those problems. After all, it is Linux. It's been quite a while since my last SUSE Linux installation (here's my review about that), but a bit shorter since my last contact with SUSE Linux... the (Core 2 Duo 64 bit Intel GMA950 ipw3945) laptop I'm writing this on is a Novell Certified machine that I bought about a year ago preinstalled with Novell SLED (instead of MS Windows). 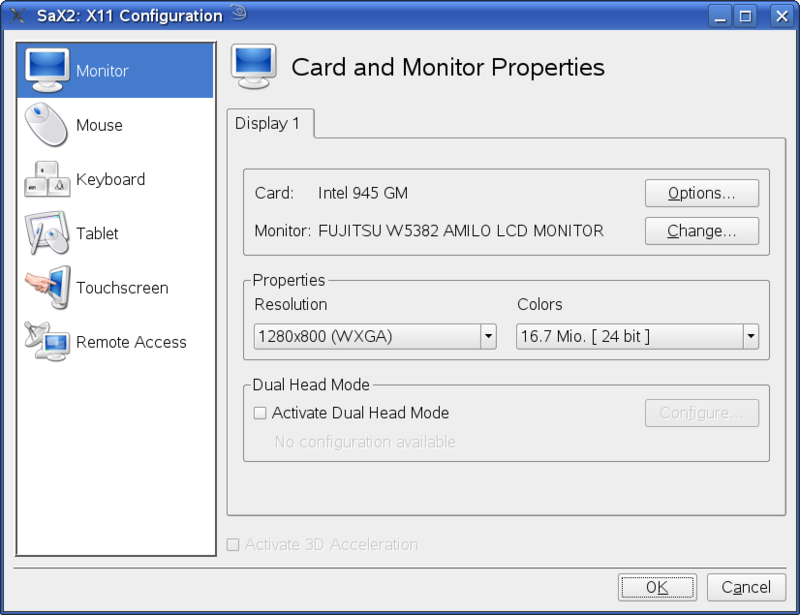 The only feature of this laptop that was not supported at the time was the built-in sd/ms cardreader. 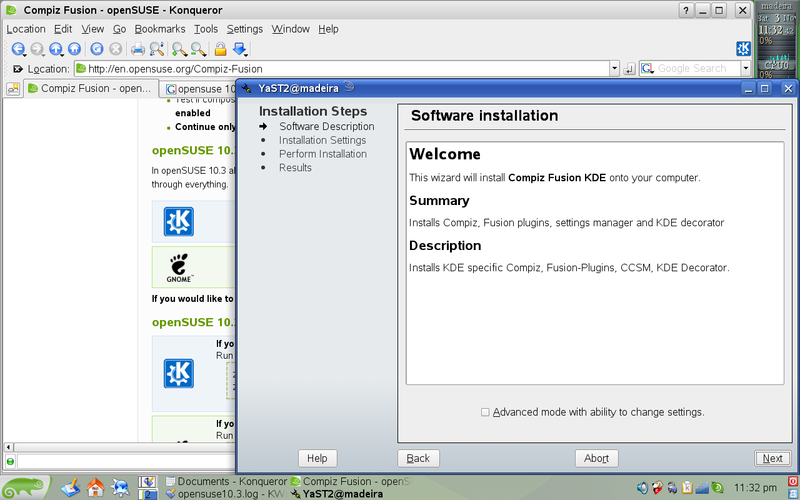 And it still doesn't work with openSUSE 10.3 - of which I used the x86-64 download DVD. Aside that, I know that all the hardware in this machine can be made to work properly with Linux. 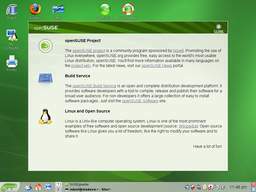 Unfortunately, to convince openSUSE 10.3 to function well was quite a wrestle at times, to the point where I now understand why some experienced Windows users who give Linux a try throw in the towel after too much initial struggling, and insist that Linux is not ready for the masses. Since I'm a somewhat more experienced Linux user, I didn't give up and managed to get to the state of fully functional fully usable almost fully Free Software bliss. As they say, your mileage may vary - may your path to a well behaved system be shorter than mine - and as you can read below, some of the (more severe) problems I encountered are clearly hardware related. 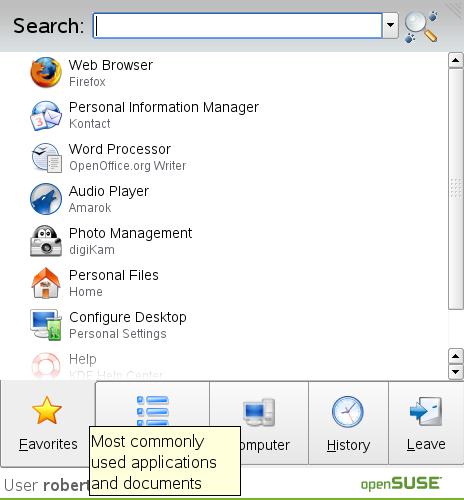 That said, considering all the issues I've seen, I would not recommend openSUSE to inexperienced users who cannot rely on an experienced on-site helping hand. You can go ahead and start bashing me now, for sure it's easy to paint me as an obvious fan of another Linux distribution who just wants to give openSUSE a bad name. Just look at the name of this site. Or, you can read what I encountered and make up your mind if you want to know why I come to such a statement. To be honest, I almost didn't want to post this review just because it pains me to write negatively about Linux but then I did manage to fix all major problems. 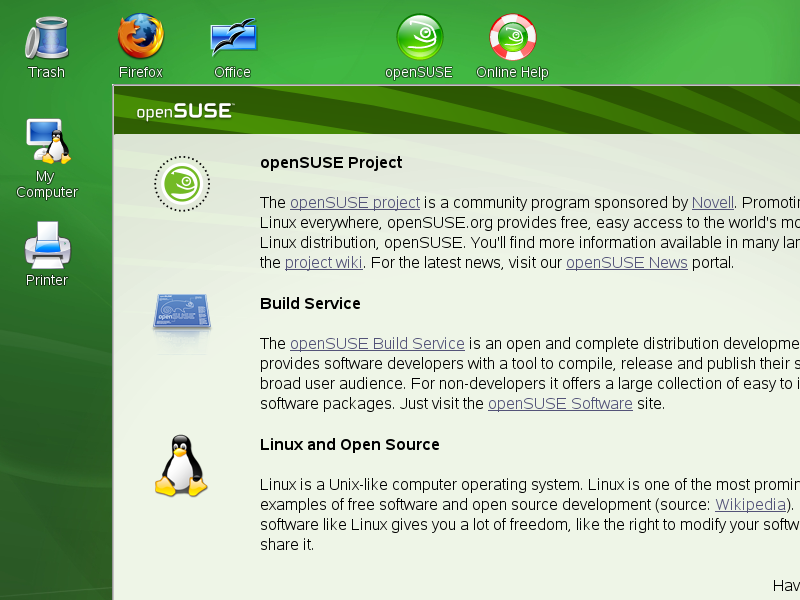 Lastly: I do think that openSUSE is a solid Linux distribution that can hold its own, and no system is perfect anyway. "The installation was straightforward, short and painless" is what I had thought to write. Before I actually did the installation. In reality, it was problematic and lengthy. I do have some very positive remarks about it, but first the major problem I encountered. 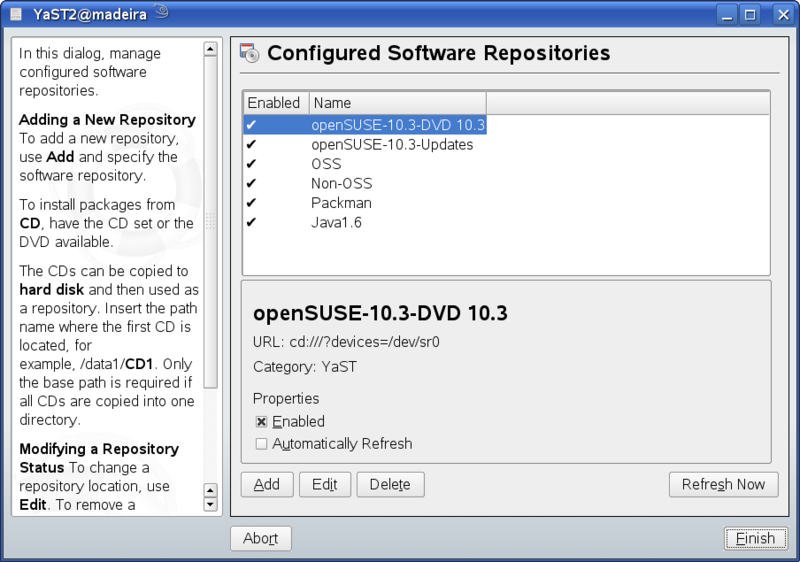 The problem: the bootloader didn't work; after the first part of the installation, openSUSE reboots, without telling me what's up next - I had no idea if I had to go into the installer mode of the DVD or if I had to reboot to the partially installed system. 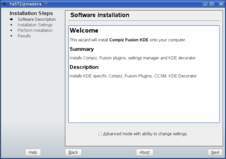 Once I figured out that I must reboot into the partial installation on the hard drive, I found it couldn't. 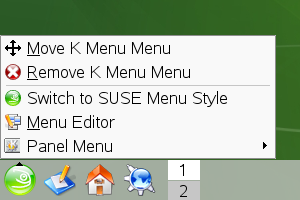 So then I realised I first had to add the openSUSE bootloader lines to my GRUB menu.lst that's referenced in the MBR (from another Linux installation). 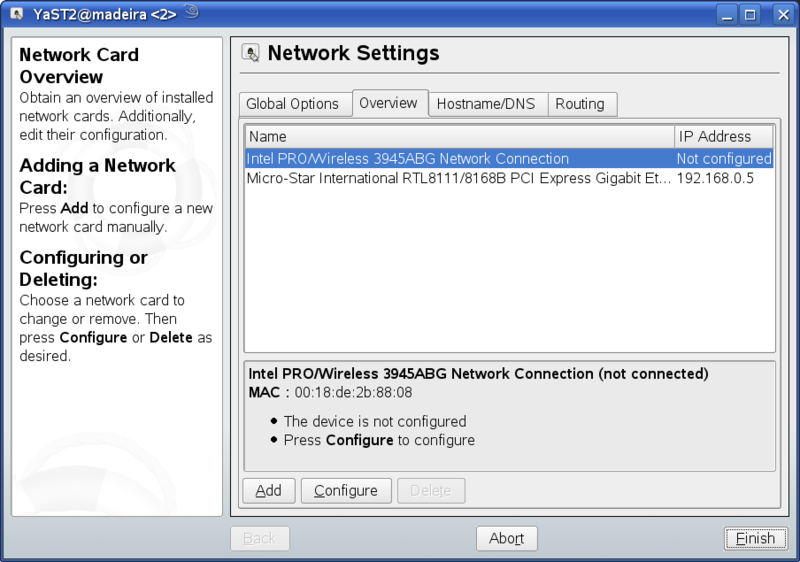 Then I did the second part of the installation, where openSUSE actually managed to get my wireless interface to connect to my wireless access point, and it notified me of updates that I let it install. Amongst other things, a new kernel got installed, and that required another reboot. And for my system: another boot into this other Linux installation, editing the GRUB menu.lst to add the updated kernel and initrd to the openSUSE listing, before I could finally finish the installation. A nice touch: after finishing the installation procedure (normally after a single reboot) one can immediately log in, so without kernel updates, there's only one reboot, just as with any other Linux installation. 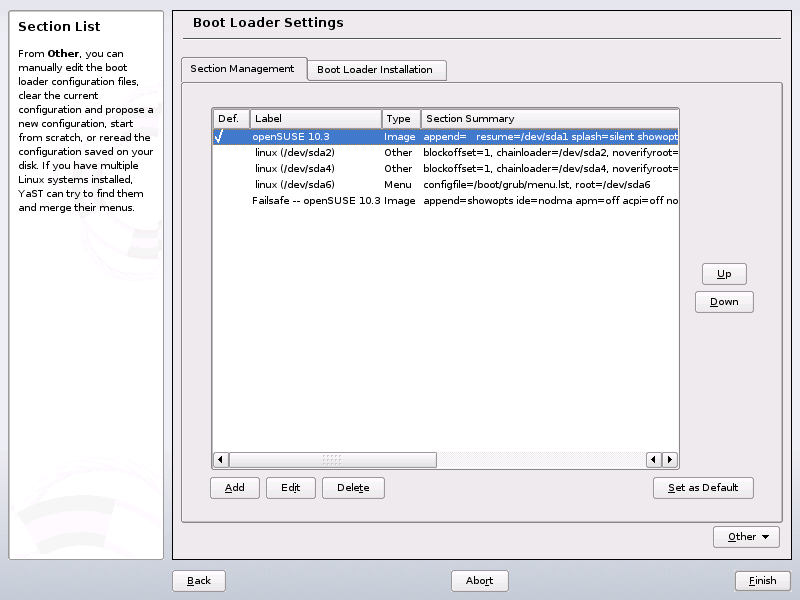 ++ the installer takes into account other systems: it can add entries from other grub menu.lst files to boot menu! 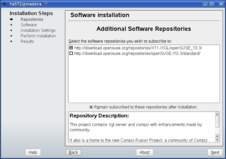 ++ the installer asks about which users to (re-)generate on the new installation; just select from the list! 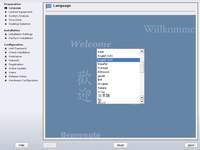 Trouble at first login: graphics problems! 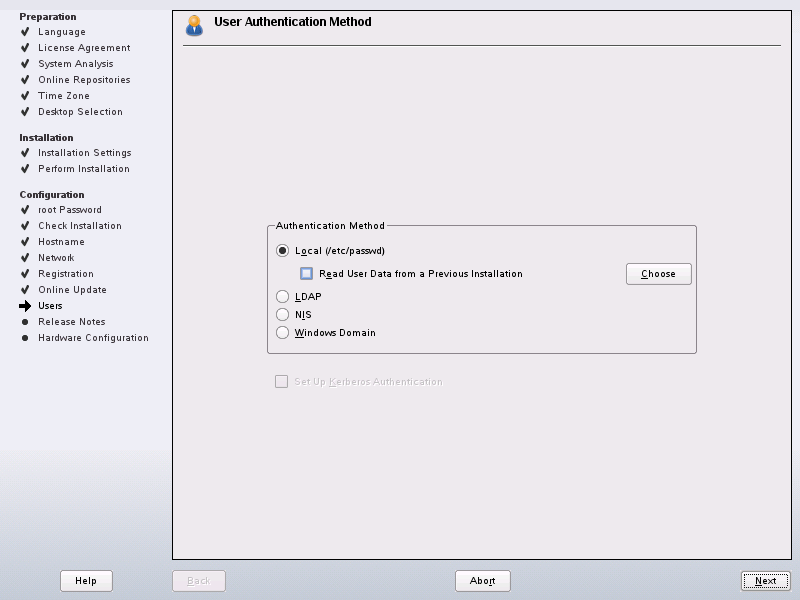 After the installation process is done, the system shows the login prompt, no further reboot. In my case, this looked funny... hmm, the extra menus at bottom don't show completely on the screen, and things appear slightly fuzzy/unfocused. Once logged in, it became clear: it's definitely very wrong..! According to the system, it was running as 1280x800 (which is indeed the native screen resolution of my laptop), but I'm seeing only the top left 800x600 of those, with no panning...! 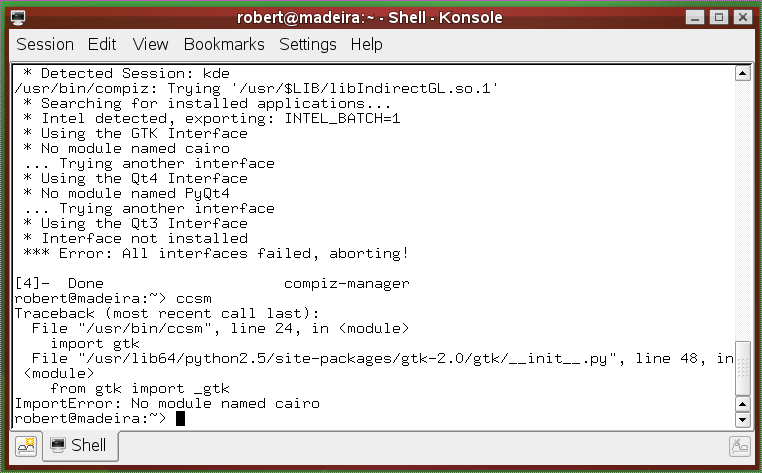 I tried to fix this with YaST (luckily I know my way around KDE and so alt-f2 'konsole' would give me the command line I so badly needed) then from the command line with xrandr, both no go. 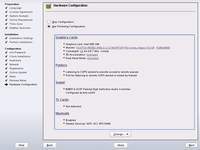 In the case of YaST it claimed the system was properly setup, and xrandr claimed that the system indeed had 1280x800 capabilities, was set to 800x600 but refused to use the 1280x800 mode since 'Size 1280x800 not found in available modes'...! I resorted to the xorg.conf file from another recent Linux installation; this gave me the proper resolution, but due to differences in hardware devices, no mouse.... 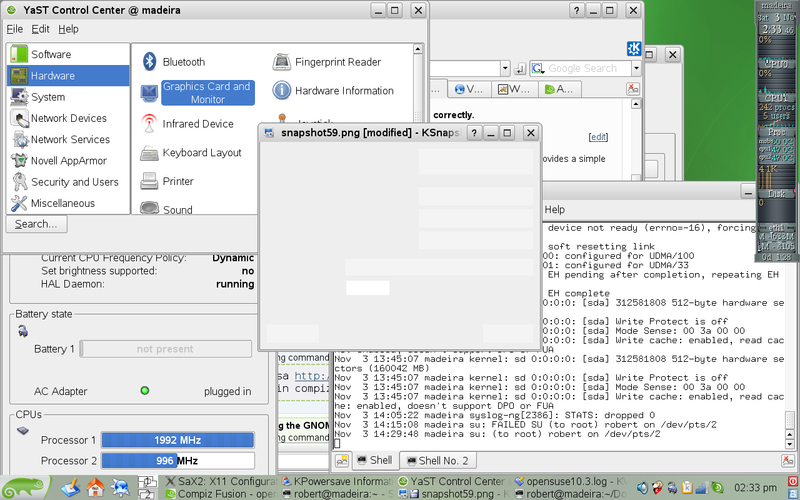 I then mixed necessary info from the openSUSE xorg.conf to have it working. A few reboots / suspend to disks later (suspend to disk and to ram both function fine - with nice 'going to sleep' and 'waking up now' screens - although in both cases upon wakeup the system sometimes claimed that it failed..) and suddenly, no more graphics... No clue as to what caused that, I don't think I had updated any related software at that point; I changed the intel driver into the i810 and things were well again, then thought I'd try to go back to the original openSUSE 10.3 xorg.conf file, choose i810 as driver ... and things worked fine. 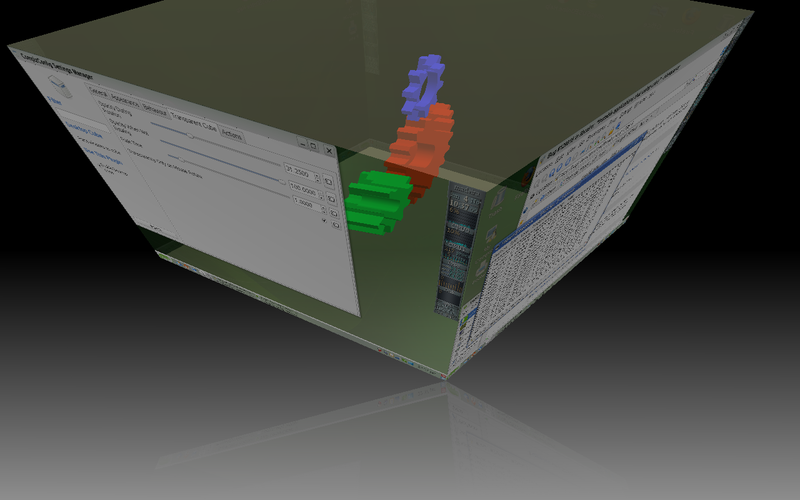 More about graphics issues in the eyecandy section about Compiz-Fusion below. 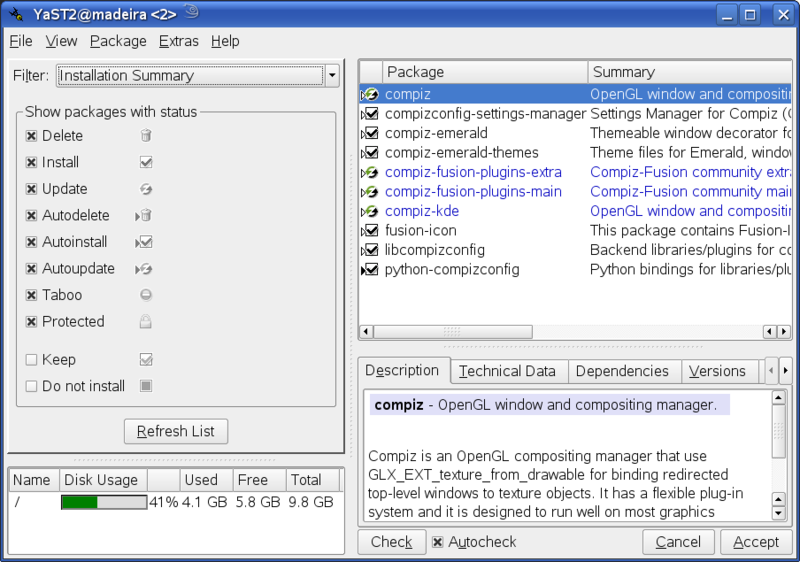 After setting up the repositories, it will download the rpm headers for descriptions, file info and dependency information and such. 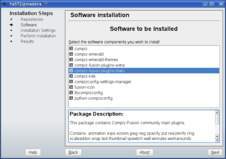 I then went and started the software installation tool from YaST and searched for the packages I wanted to install. All this worked fine, as it should, including the necessary dependency resolution. 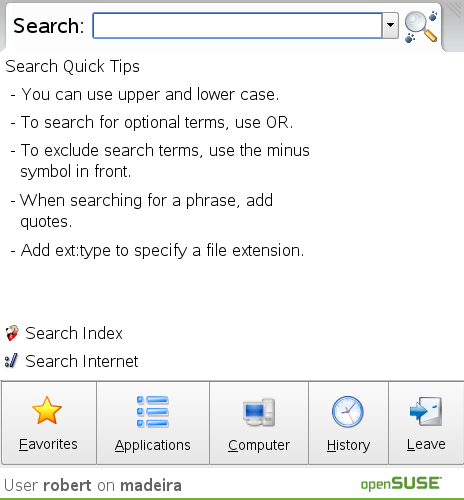 The one thing I can say is that the software installation tool takes a _long_ time to start up, and during searches it's not always clear if it's done searching and ready for the next search string, or still busy. The software installer can easily take 2 minutes or more to start; I didn't see much network traffic but mostly lots of disk activity (~2MB/s; the harddrive in this laptop can easily do ten times that, no idea why it's so slow) with at most just one cpu (this is a 2GHz Core 2 Duo machine) showing somewhat high loads (~50% range mostly, sometimes over 80% - and yes it would jump from its 'low load' 996MHz speed to its 'high load' 1992MHz). 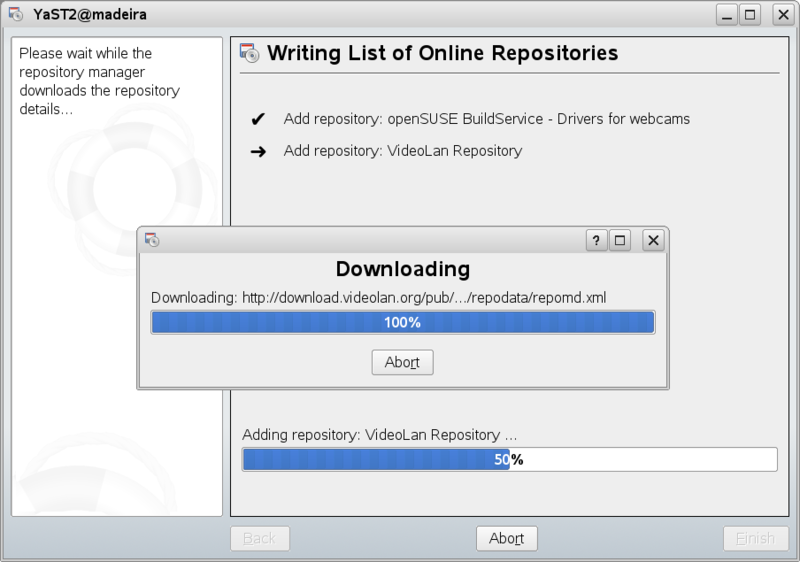 And that's with (merely) these repositories: main, main updates, SUSEdvd, videolan, Packman, X11xgl, non-OSS, java1.6, OSS, webcam drivers BuildService. 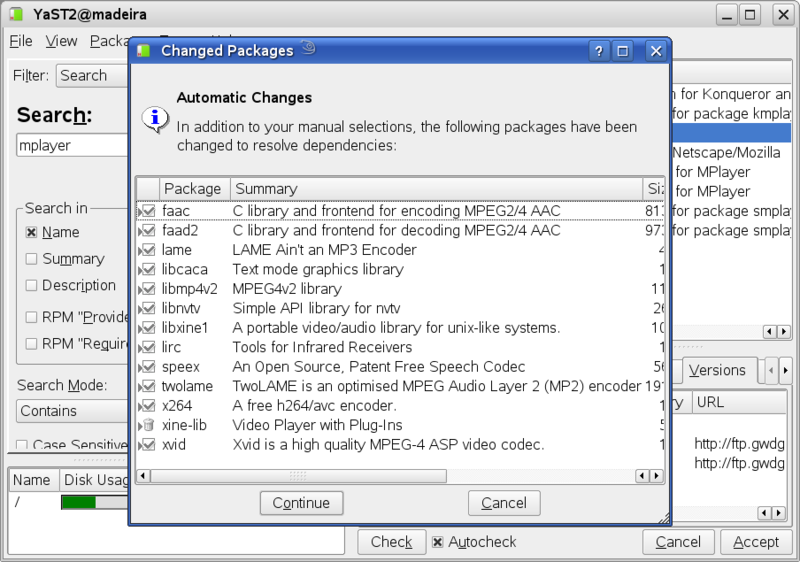 DVDs are encoded in MPEG-2 video, for which there is no support in the current SUSE Linux OSS release, due to the MPEG-2 format being patent-encumbered by its owners, Moving Picture Experts Group (MPEG).The patent holder is unwilling to offer an unrestricted patent grant, as required by the GPL. 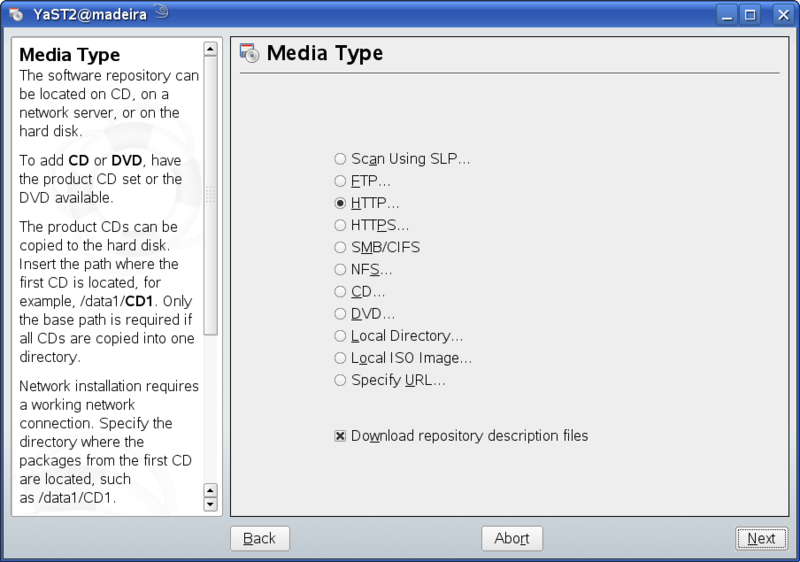 In addition region-coded DVDs are encrypted with the Content Scrambling System (CSS). There is an opensource project called libdvdcss that bypasses this encryption. 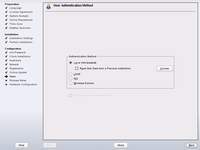 Though the encryption is weak, using any method or device to bypass this is classed as a 'circumvention device' in countries such as USA & Australia and is illegal. In some countries it is legal to backup your own DVD. 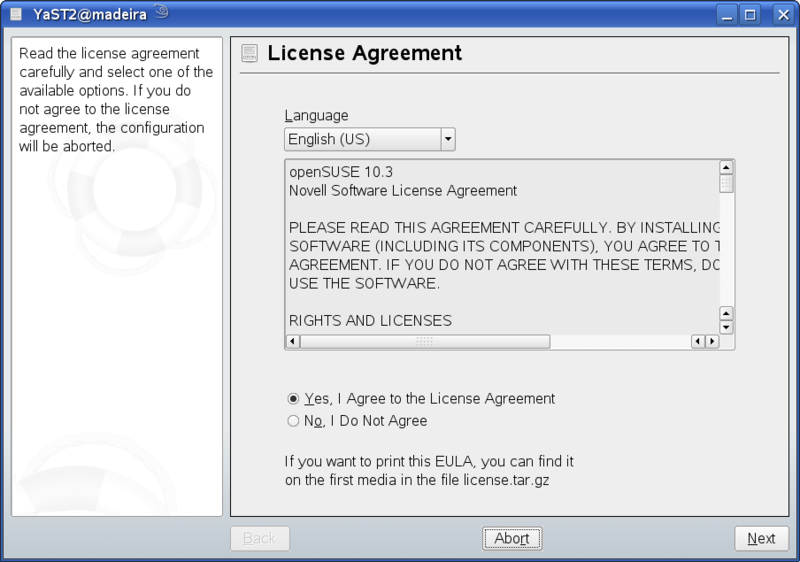 If you do not require compatibility with a DVD player, consider encoding your own videos in Ogg Theora. 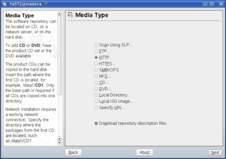 MPEG-4 is another format that may be used, though it may or may not suffer from the same legal issues. 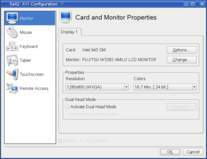 MPEG-2 encoder and decoder cards exist with driver support for Linux provided by the manufacturer and distributors. 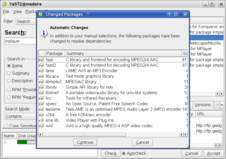 While they may or may not work specifically with openSUSE, they are a legal and licensed way of acquiring MPEG-2 playback on your Linux PC. 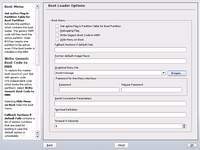 If the DVD is unencrypted, this will make playback available. Search the Package Selector for libdvdcss and install that package when it appears. 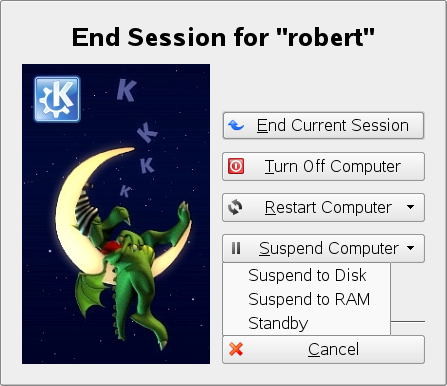 This will add the ability to decode DVD video discs, but in GNOME the default Totem player will not be able to play DVDs, nor will a DVD player come up by default when you insert a DVD video disc. 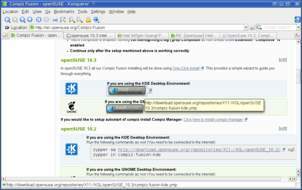 In KDE, Kaffeine will be able to play DVDs after you've updated the Xine packages it uses for video rendering. 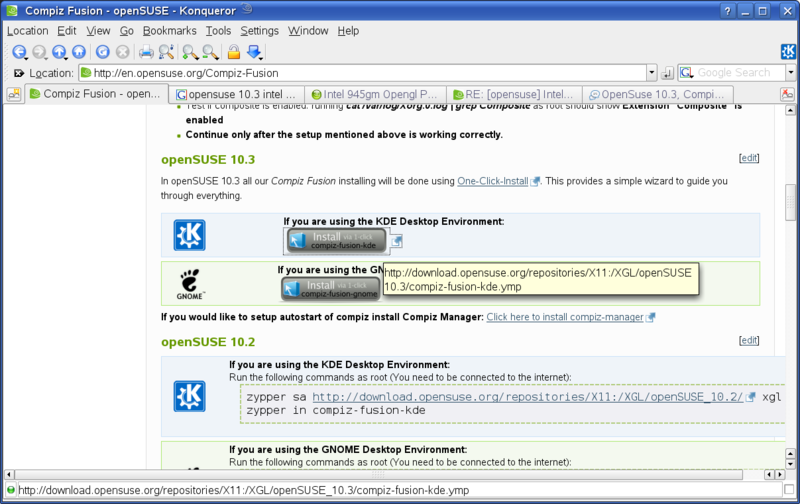 To solve all DVD problems in KDE and GNOME, install the xine-ui package in addition to libdvdcss. 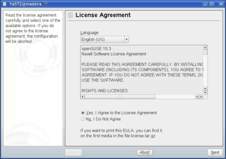 If you installed the Packman repo as advised above, a DVD-enabled edition of Xine will be available to you to install. 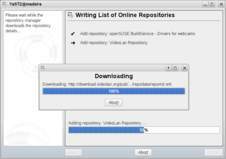 The default Xine packages available through the openSUSE OSS repos are purposefully disabled to prevent you from using libdvdcss, so Packman is a requirement. That last bit is very silly, it means that xine is patched explicitly to disable compatibility with libdvdcss. A waste of resources and a headache for uninformed / unsuspecting users, without any benefit to anyone. Ah well, dvd playback was working fine (but video displaying wasn't entirely, see below), and admittedly it wasn't much more effort to get going than if xine had been able to work with libdvdcss out of the box; but that's only thanks to Jem's gem. In terms of wireless, I soon figured out that the indication that the new open source iwl3945 supposedly could/would function well after suspending was incorrect. Rats, I was really hoping to be able to live without the proprietary daemon ipw3945d, but messing with my Intel 3945ABG Wifi held some interesting lessons. 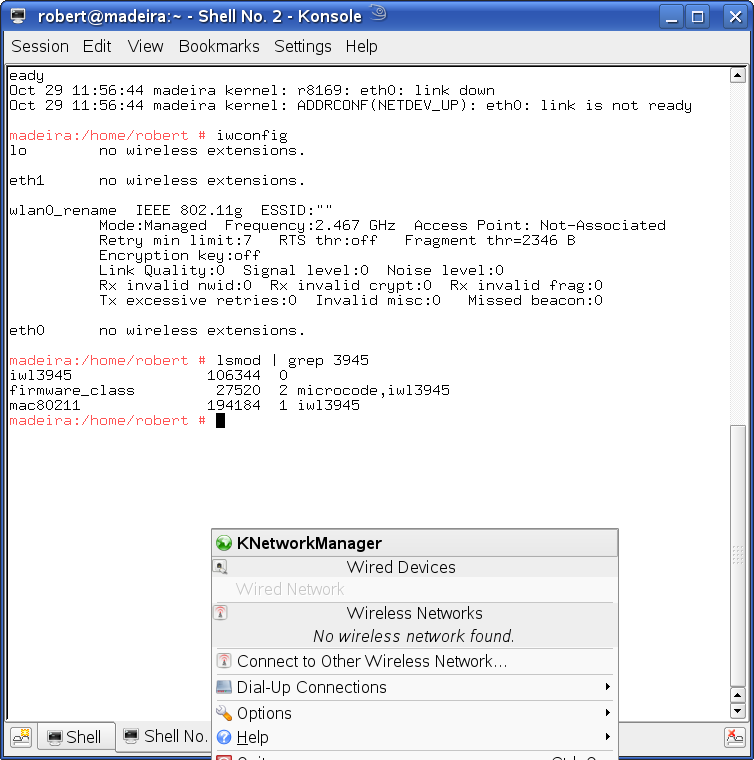 For instance, I managed to get the wifi networking going via the command line (after a suspend, which disabled it thoroughly), as root, but even though I could ping various webservers, my konqueror insisted that 'offline-mode is active'. 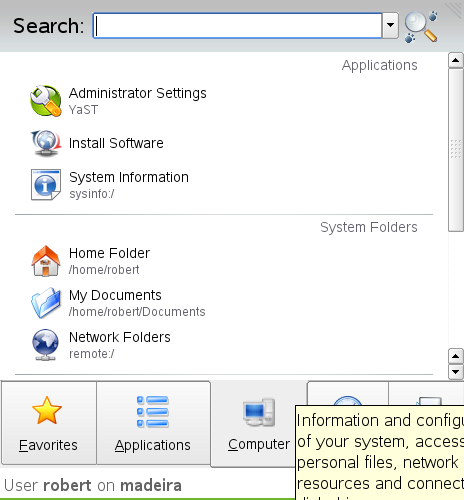 So I realised I had to follow the 'official' GUI way, either via YaST or KnetworkManager. 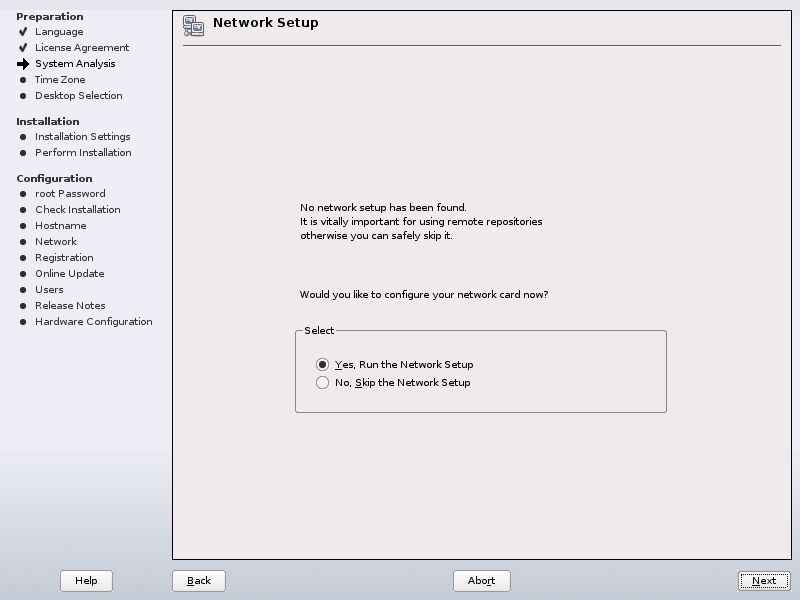 The system told me this: the device is not configured?!? 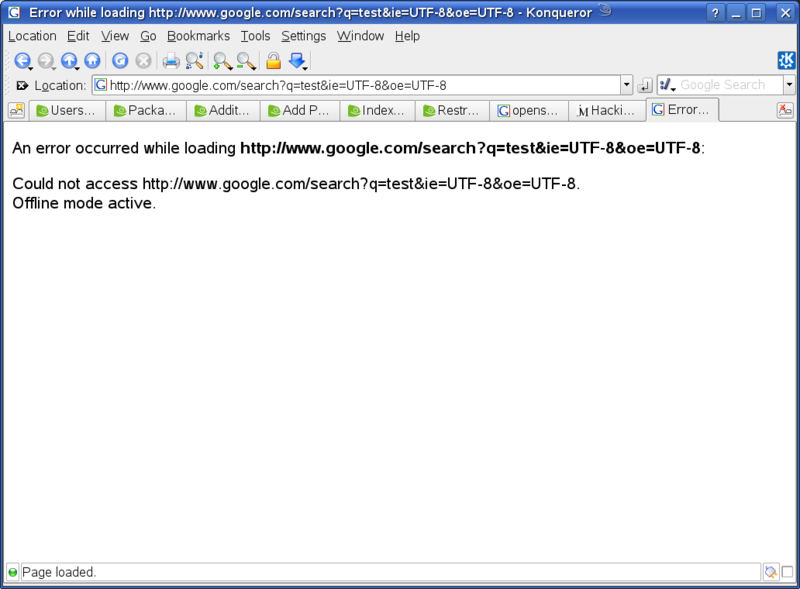 I tried to reconfigure with YaST, but it didn't work, iwlist scan didn't show any networks. 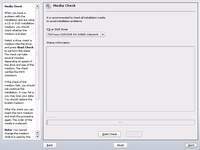 This workaround had to be done after each wake up from suspend to disk or to RAM. With the iwl3945 driver which I would prefer since it's fully open source, this doesn't work. I can unload the module, but reloading after a suspend will never ever give me any networks when running iwlist scan, so for the moment ipw3945 plus ipw3945d just works better, but I'll be happy to drop it as soon as the iwl3945 driver is up to the job. I've been using openSUSE for several weeks now, and I must say that it's a perfectly usable Linux system, with some minor rough edges. Suspend to RAM, disk all work out of the box (with a goodlooking 'going to sleep' screen). So does cpu frequency throttling, no messing with /etc/*.conf files required. Did I mention at the start of this review that the built-in card reader doesn't work? 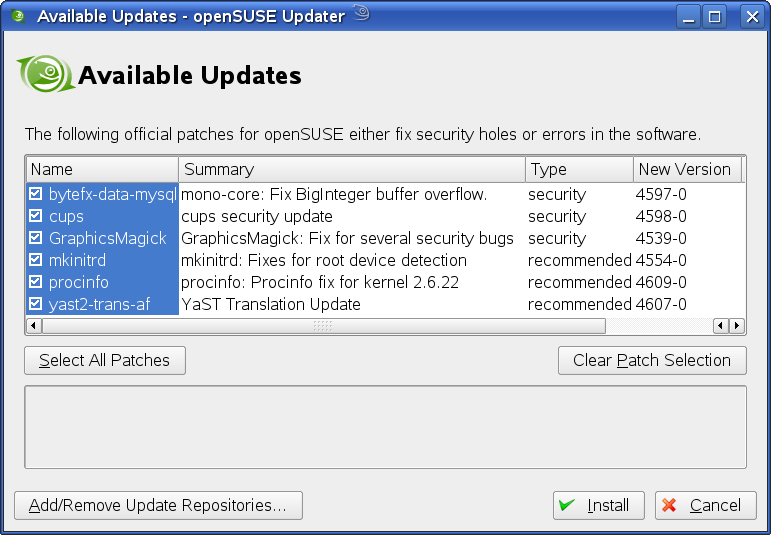 Well, it just started working, with the kernel update to version 2.6.22.12-0.1-default. It's a combined SD/MMC/MS reader, and both SD and MMC function fine. 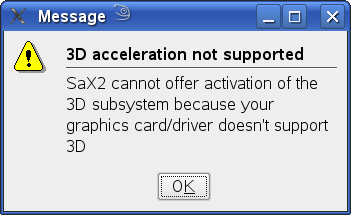 I tried a (borrowed) MS card, but it didn't work. 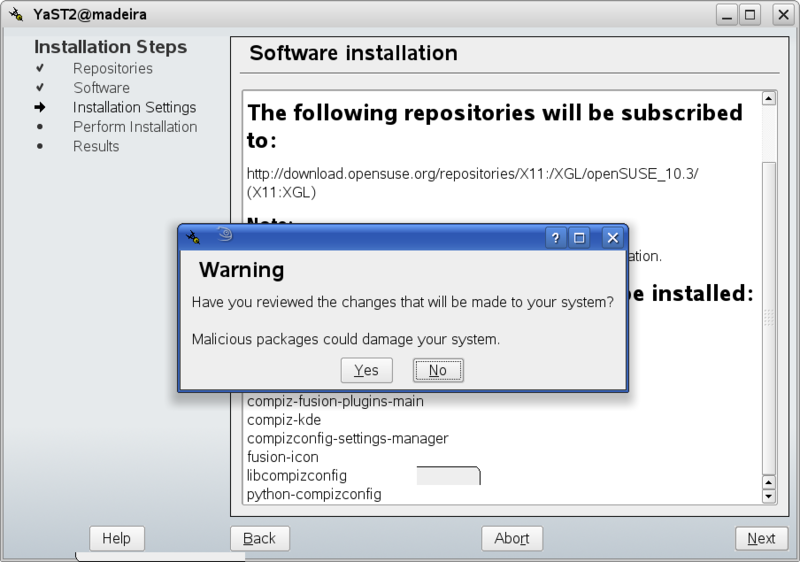 For that, blame SONY, not openSUSE, Novell or Linux. And best stay away from it, while you're at it. 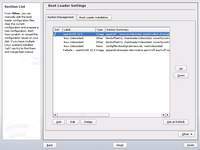 The automatic Updater works like a charm, discrete yet fully functional, making sure your system will get all available updates as soon as you desire/allow it. This works fast, amongst other things due to the use of delta-rpms. 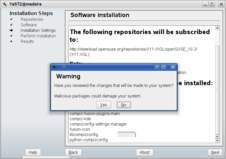 The amount of available software packages is huge, unfortunately so is the amount of repositories. 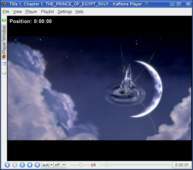 For instance, I couldn't find stellarium or camstream; which repository holds it? How to find out? 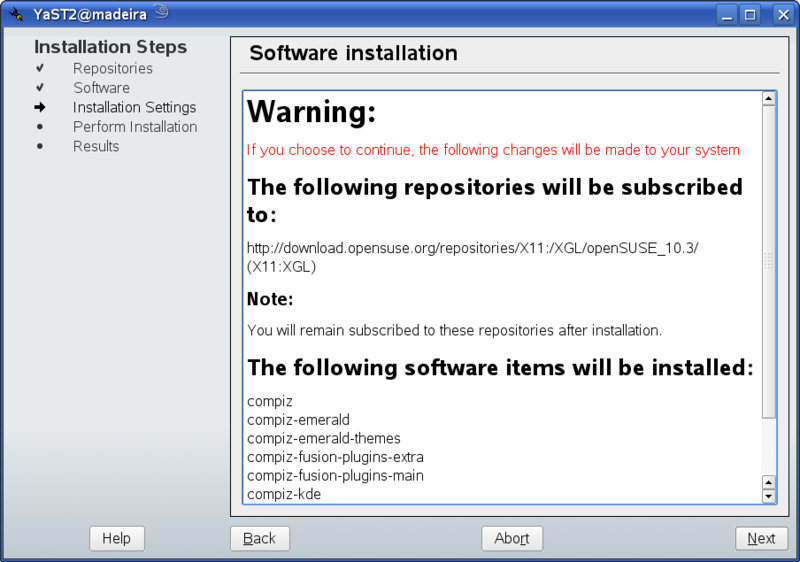 Sure, I could add all of them, but I didn't want to bog the software installer down even more. 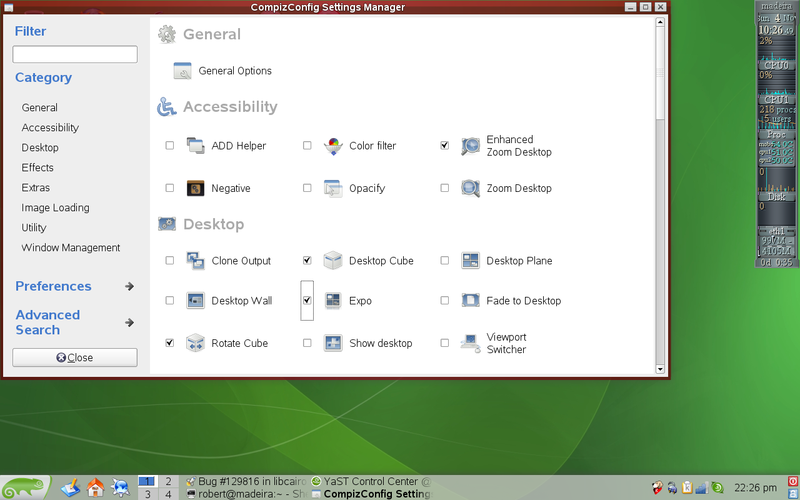 openSUSE has a new menu structure - fancy, goodlooking but perhaps not extremely practical. 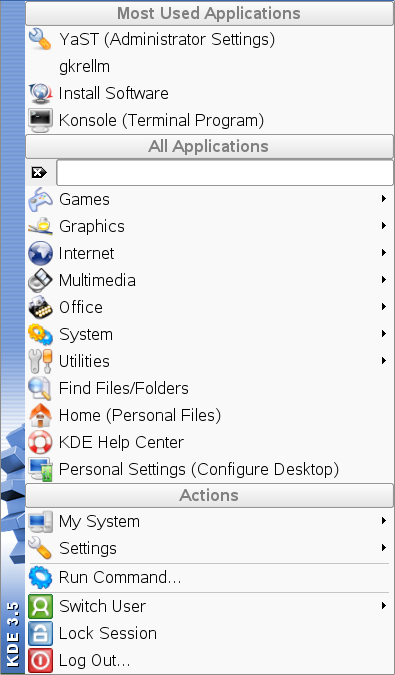 Luckily it's possible with a right click on the menu button to go back to the classic KDE type menu. 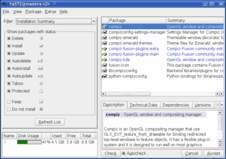 This has to do with java; Firefox just shows that a plugin is missing. I use konqueror most of the time anyway, so I'm not in the mood to investigate and/or fix this, but my guess it's because the 64 bit Firefox doesn't work with java, konqueror does. Perhaps it's just a better webbrowser. 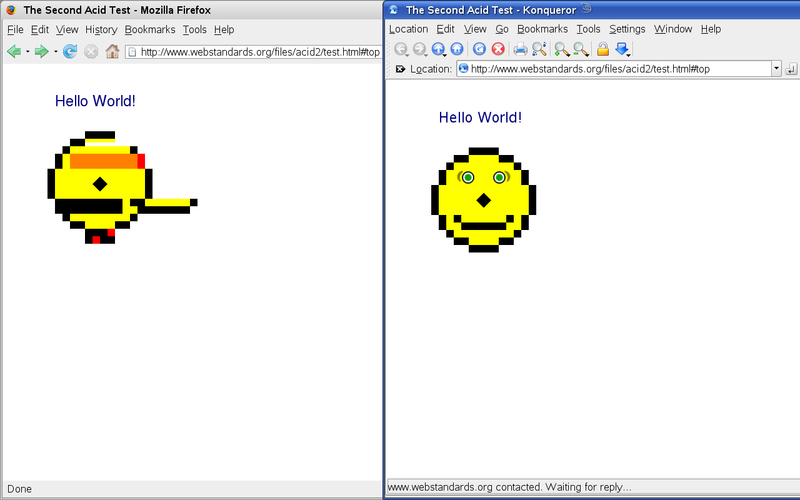 See also the acid2 test page for web compliance. My Philips (pwc.ko) webcam had vga (its highest resolution) working out of the box. I did not find my favourite package to test it (camstream) so just used some other programs (wxcam, camelot) which I found to be very crash prone (wxcam) or dysfunctional (camelot). I just wanted to see if vga resolution was working, but opening the preferences dialog would crash wxcam; in the end I edited the wxcam config file to find that indeed vga works fine. I later ran modinfo pwc to see that I could have gotten my info there too. Ah well, live and learn. connecting to any website with cookies asks permission... scaring uninformed users into thinking something dangerous is happening..? Silly default. bash requires double tab presses to autocomplete if there's more than one possibility; on the first tab key press it does nothing at all. What's the logic in that? Does it cost more to autocomplete immediately? Note 2: doing ctrl-shift-right/left once, letting go of all keys, then pressing all three keys again will just count as the first press and hence not have any result at all. Demo effect: I wanted to show this to my wife and ask her opinion, suddenly things worked fine. Reason: since I was showing her, I turned the laptop and then used the _left_ control key, where it does work straight away - it only acts this weird on the _right_ control key...! For no reason whatsoever, during the writing of the log file (my log file of my opensuse 10.3 experience, which you are reading the web formatted result of right now), kwrite sometimes stalled completely, for several seconds. This had nothing to do with cpu or disk activities (so please don't blame kerry beagle, it goes on the list of unproblematic and well working stuff), gkrellm kept getting updated and indicated nothing of the kind. Quite baffling. 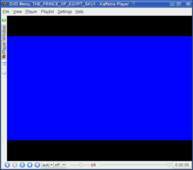 Mplayer also wouldn't work with the xv driver; setting xshm in mplayer worked, but there was no proper scaling to full screen, the image stayed the same size, but just with very large black borders. 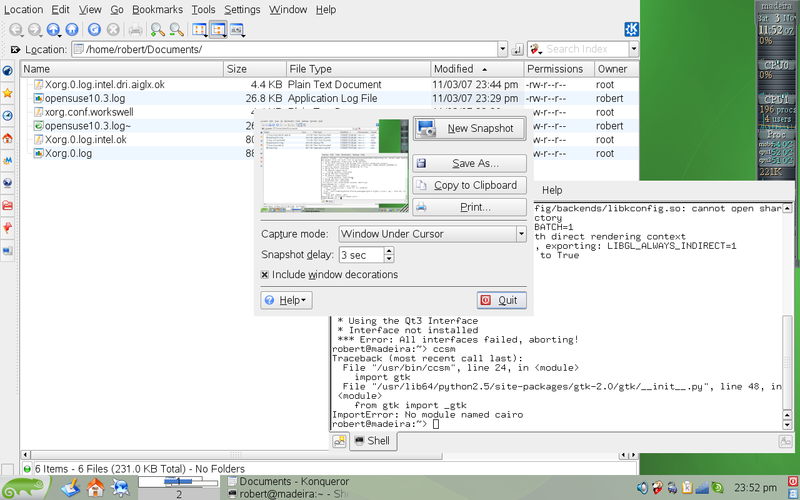 In xine, scaling was ok, but only with xshm (it crashed with the xv driver, just as mplayer). 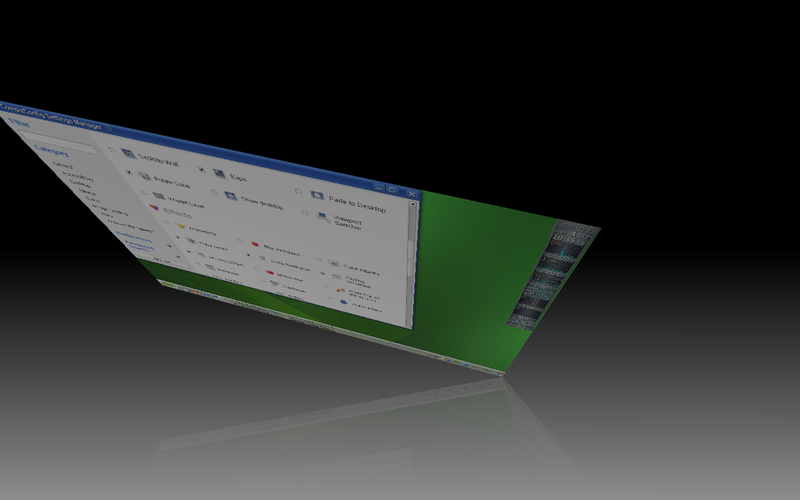 As a last thing I wanted to have a look at the practically obligatory eyecandy: compiz-fusion. Well, I would have been curious to that other 3D desktop Metisse, but it seems not to be available to openSUSE in an easy way (yeah, ./configure make make install is too much for me, this is 2007). 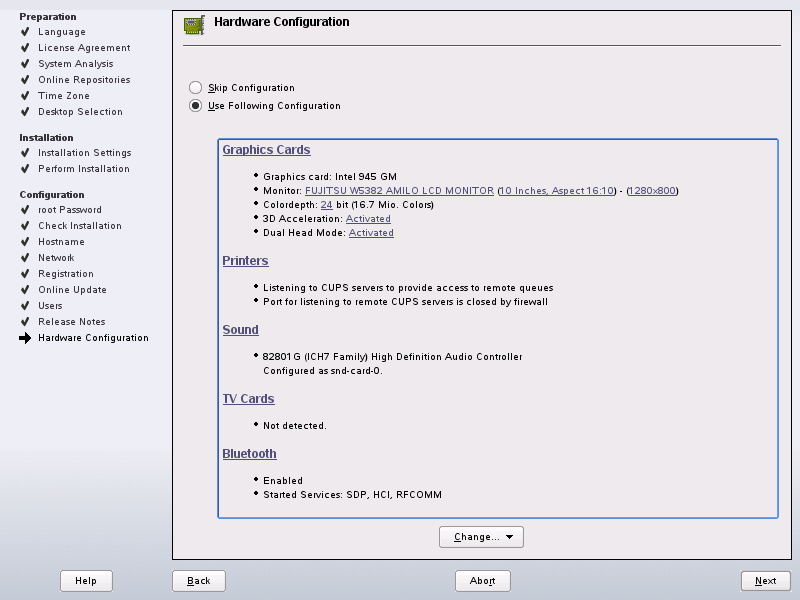 "make sure it runs with composite extension - YaST -> Hardware -> Monitor"
I eventually managed to fix that by going back to the 'intel' driver, and I also turned on AIGLX in the xorg.conf file. I then had problems with DRI, turning on 3D accelleration via YaST had the Xserver set up to offer direct rendering only to the users of the group 'video', whereas regular users are all member of the group 'users'. It's very annoying to have to track such an error (no direct rendering for regular users, for root all was fine) with a completely correct xorg.conf and positive Xorg.0.log - I ran glxinfo and glxgears as root and all was fine, whereas it wasn't for my regular user, so that gave it away. 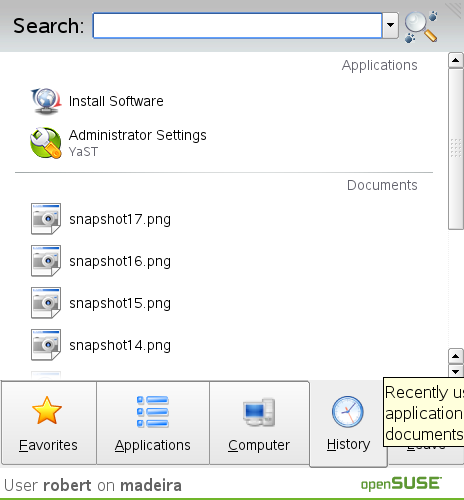 Why openSUSE sets things up like that is a complete mystery to me. As if things are too easy to set straight otherwise? 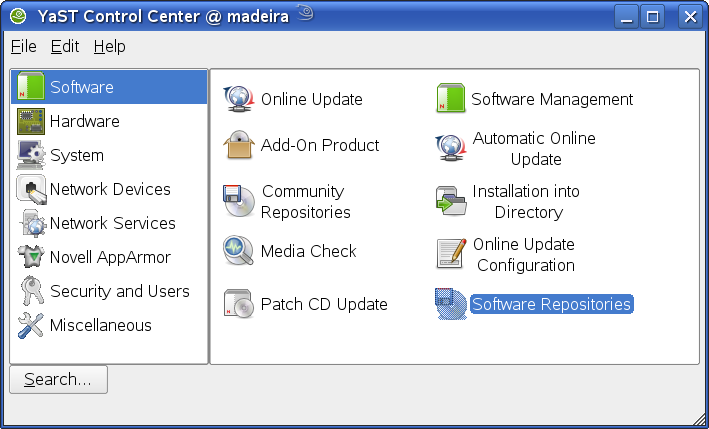 which installed lots of stuff. Very smooth, very handy! I noticed an error but didn't know what to make of that. 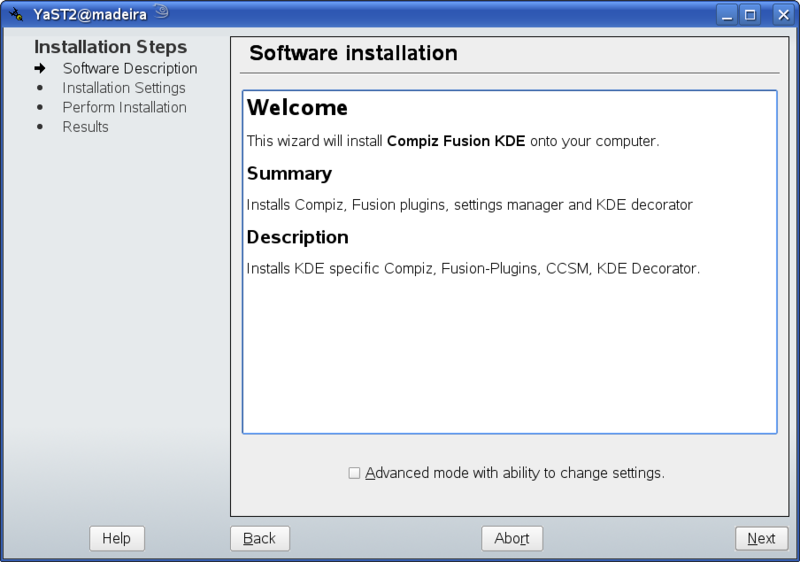 Compiz-fusion would run, but there was no way to start ccsm; it gave a weird error - eventually I found out that the python-cairo package that got installed was the i586 version. 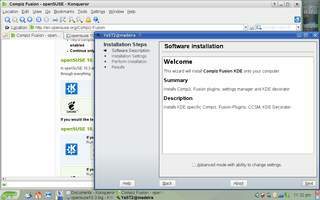 Took quite some time to properly deinstall that one and get the x86-64 version, after which all was well - Compiz-Fusion plus a way to config it! 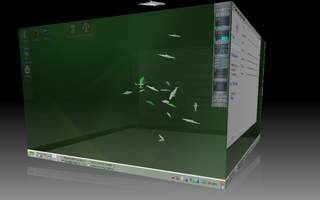 the screensaver shows something similar, but at the lower right corner. 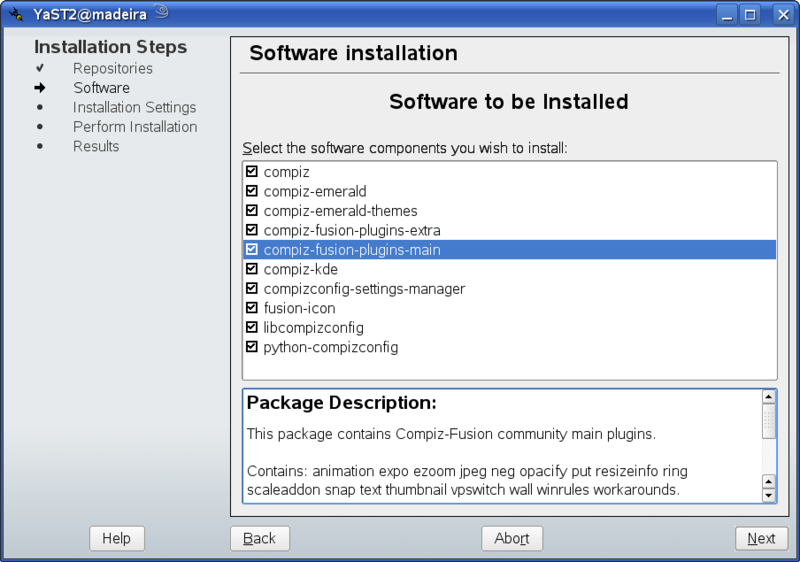 I see the point of claiming no need for compiz-fusion and the like if it's to focus on fixing other things that are more essential. I don't agree, since those things are not getting fixed by the same people. I do still miss some of the features that beryl already had, but I'm sure they're being worked on to get back. Perhaps I should post a request list at some point. 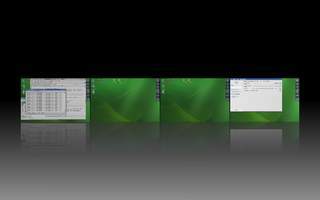 On the whole, openSUSE offers lots of options throughout, from the installer to the system configurator YaST (seemingly "all of them"), which is well suited for powerusers, but some of the defaults and system choices just aren't. 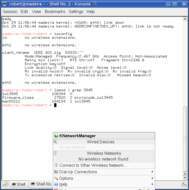 No simple software installation from the command line? 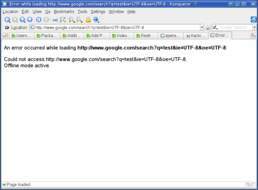 Crappy bash autocompletion? Stuff like this makes me say: perhaps not for power users. Lots of nasty issues (graphics, locking up, faulty dependency resolution), which makes me say: not for beginners. At least, not unless they have an experienced assistant standing by. 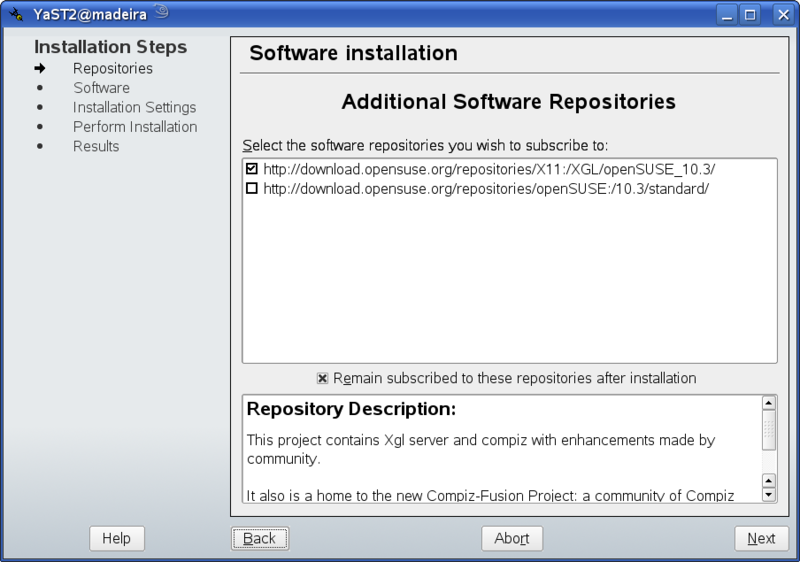 Some choices are strange, like the fact that the regular xine is still crippled to be incompatible with libdvdcss. This takes extra effort, for no reason. 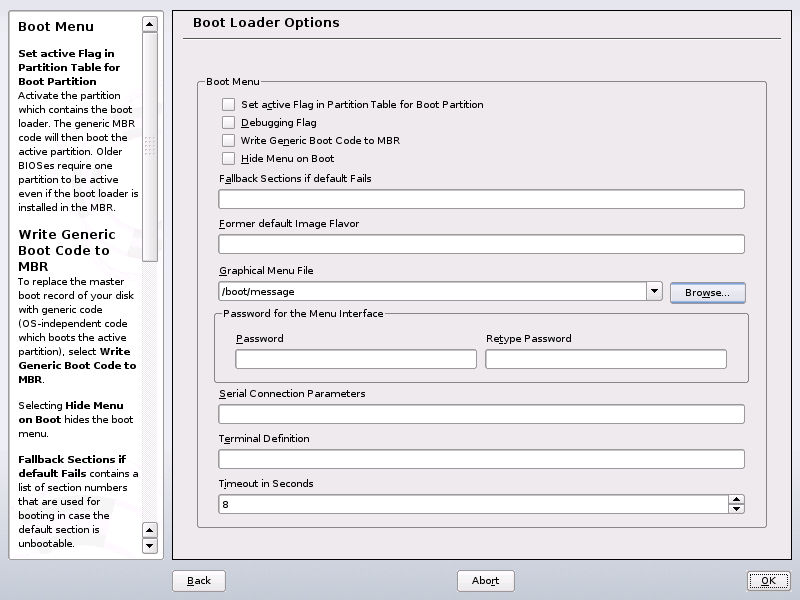 On the other hand, the pwc webcam driver is fixed for vga, though the kernel maintainers don't want it in the mainline kernel due to the code being patent encumbered (by Philips / Philips Semiconductors / now known as NXP), and this is apparently no problem for openSUSE. Ok, I'll stop being mean. 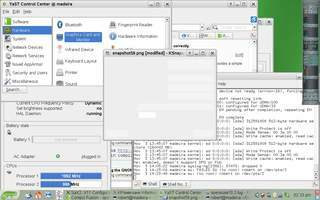 Truth is, after using it for a few weeks, I can say that openSUSE can certainly do its thing for you, it is a fullbred Linux distribution. In case of trouble, it all depends if you really want it. Me? I'm done for with it ... for now. 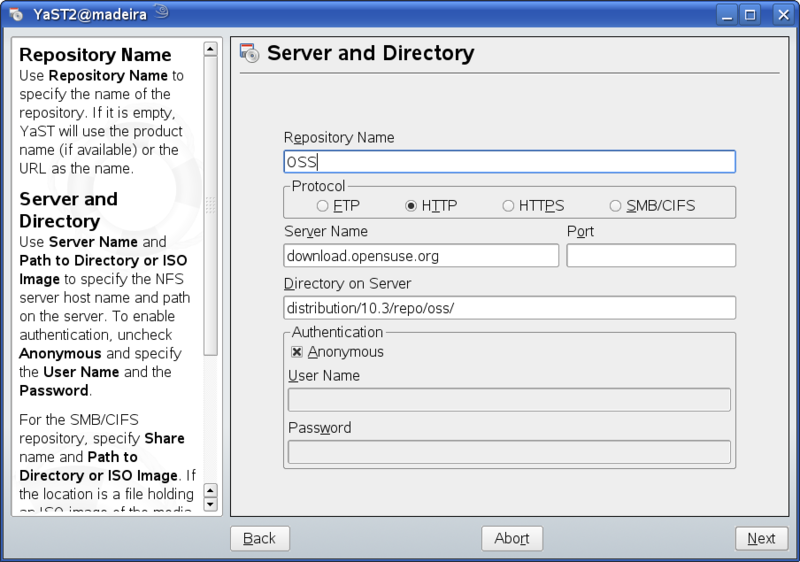 All contents © copyright 2003 - 2007, unless mentioned otherwise, published under the GNU Free Documentation License (FDL) by aRTee. Artwork and CSS don't fall under the FDL, standard copyright applies. Tux image from Larry Ewing. 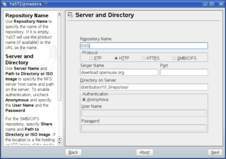 You may use anything published under the FDL on this site freely, as long as you include this copyright notice and a reference to the main address of this site: www.mandrake.tips.4.free.fr.